Richard Brophy contacted me in April 2016. He wanted to revamp the website for his bouncy castles business. His site was hosted on Weebly. There wasn’t much information about each of the available inflatables – and there were a lot of inflatables. This made it difficult for potential customers find an inflatable appropriate for their occasion and their location. Richard pointed me to one of his competitors as he liked how they presented inflatable information. Looking beyond the intense, blinding colour scheme, it presented extensive information about each inflatable e.g. type (bouncy castle, obstacle course etc), price, dimensions, suitable ages and whether it can be used indoors or outdoors. This fit with one of my principles about website content – provide as much information online so that customers don’t have to call you with questions (though I am guilty of not doing that). Inspired by that site, we drew up a list of information fields for Richard’s stock of inflatables. I created a WordPress site and styled it similar to the Weebly site – Richard liked the current look and felt that it didn’t need to be changed. I set up the admin area to make adding the information for each inflatable intuitive. Most of the information was optional though I encouraged him to complete all the sections. Belgrove Bouncing Castles works with a number of venues in Wexford county. Richard knew which of his inflatables would fit in each venue. This information is specified for each inflatable. This allows the venue information page to list all the inflatables that will fit there. It is good to allow customers find the information via different routes within the website. If the customer has a venue in mind then they will see only inflatables that fit. This makes their decision process straightforward. To further help the customer’s decision process, each page has an enquiry form. When Richard receives the email he will see what page the form was sent from. 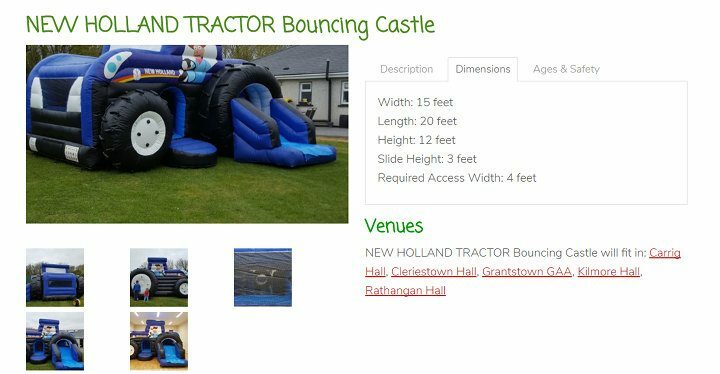 Since making the site live in July 2016, Richard has added a number of new inflatables – the easy to follow admin area is working well. The site is fast and easy to navigate. The presentation of inflatable information was inconsistent, with most of them not listing the size or age suitability information. I used Advanced Custom Fields to create the data fields – dimensions, age groups that it is suitable for. I used Advanced Custom Fields Pro Gallery field to allow Richard add multiple images of the inflatable. The photos can be reordered with drag and drop. To simplify content maintenance, I created a “Bouncing Castles” CPT. It was a placeholder for the ACF fields – they were set to show when the post type was “Bouncing Castles.” The Venues were set up as a taxonomy attached to the “Bouncing Castles” CPT. When the client is in the admin area it is clear where he should go to add or edit an inflatable. The site is built on the Genesis framework, using Sridhar Katakam’s Starter Child Theme. The Genesis framework is lean and fast. There is no bloat here. For the archives I wrote a custom loop that displays a photo of the inflatable, its name, a short description (excerpt), its size and the age group. Customers can quickly consider or eliminate an inflatable from the list of possibilities. Inflatables can appear in archives and in the Venues pages. I encouraged internal linking between inflatables where relevant e.g. suggest an alternative inflatable for a different age group when the viewed one is not suitable, or when two inflatables can be combined. Each page has a good SEO friendly url. There is an enquiry form at the bottom of each inflatable’s information. I used the Contact Form 7 Dynamic Text Extension plugin with this. The form includes a hidden field with the name of the inflatable. When the client receives an enquiry email he can see what page the customer was on. Earlier this year I wrote about using this plugin in a product enquiry form for WooCommerce. There I used the built in CF7_get_post_var but for this project I created a shortcode because I didn’t realise that CF7_get_post_var was available.